These corn cakes fill the can or want to, although traditionally here fill of vegetables (eggplant, peppers, onions etc). 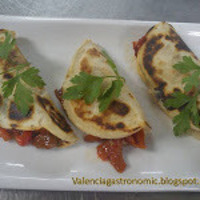 They are ideal to surprise your friends in a quick dinner, and if you tell them it's a Spanish recipe, even better. 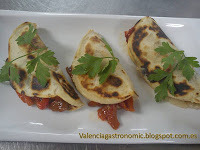 Try them, is an easy recipe that you will love. Firstly, we roasted two eggplants in the oven for about 25 minutes at 200 Â° C, until tender, whether the outer skin burns a little, as this will give a distinctive flavor to our grilled, meanwhile, put in a saucepan the 3 Â½ cups of water to boil with a little salt, half onion grated with a grater and olive oil to a boil, then introduce two cups of flour and a cup of cornmeal, and stir vigorously with a rod as shown in the picture. Once the dough thickens and begins to pull away from the edges of the bucket, we get dough from bowl and let cool slightly 2 or 3 minutes on a marble table or steel, so that you can knead as you would a bread dough. Later kneading and after obtaining a fluffy texture is replaced in the container where the mass was performed, keeping warm to whet the pancakes. Eggplants when roasted, should be peeled and its flesh is cut into thin strips with a knife, then place cut pulp in a bowl with olive oil, a little salt and two cloves of garlic finely chopped, so that we allow the flavors to blend the eggplant with garlic. Subsequently, dry desespinan chaplains (cod), skinned them and desmigan fingers, reserving them on a plate for later use. Between two sheets of paper with an anti-stick or plastic bag open, put a small piece of dough (a ball) and flatten with your hand, forming a pancake or thin disk. Is then placed in a hot pan or griddle with a few drops of oil to brown, turning when you start taking tan. Once golden take them out and reserve for filling pancakes. We place the patties on a platter or tray on top is put a few tablespoons of roasted eggplant with garlic and decorated with some flaked cod, completing the decoration with a sprig of fresh parsley.